On May 4, 1996 a celebration was held in Iwama, Ibaragi Prefecture, to commemorate the 50 years Morihiro Saito of the Ibaragi Shuren Dojo has spent in aikido. Following opening remarks by Yoshimi Hanzawa Shihan, speeches were made by Aikikai Hombu Dojo-cho Moriteru Ueshiba, and the Mayor of Iwama who expressed thanks to Saito Shihan for his contributions to the town. After the presentation of gifts and flowers, Saito Shihan made an address (excerpts of which appear below) and donated funds for the welfare of the elderly in Iwama. A toast in which Hiroshi Isoyama Shihan of the International Aikido Federation called Saito “a modern-day Miyamoto Musashi” completed the ceremonies. Some 400 people gathered to celebrate Saito Shihan’s half-century in aikido, including old-timers like Zenzaburo Akazawa and students from all over Japan. Numerous foreigners were also to be seen, offering a glimpse of the international character of Saito Shihan’s activities. Thanks to my teacher, founder Morihei Ueshiba and his family, I have been able to come this far in aikido. The past 50 years have included times of great enjoyment and of hardship. When I became a student of Ueshiba Sensei back in 1946 there were already several uchideshi in the dojo. Many went on to become world-class teachers. They made me work hard, to be sure, but they also took good care of me. Uchideshi life back then consisted of rising before the sun to pray, training, and eating two meals a day of rice porridge with sweet potato or taro. The rest of the time was spent working on the farm. Many of the old-timers here today no doubt helped O-Sensei with the farm work. He was always asking people to help, so being an uchideshi was pretty hard work. I myself had a job with the National Railroad, so every other day I got to slip away. The founder would act on things as soon as he thought of them without paying much attention to the convenience of other people or their households. He would just suddenly say, “Everybody come tomorrow, there’s threshing to be done!” Of course, everyone had other business to attend to, but somehow we all ended up putting in our time anyway. Eventually, though, the sempai stopped coming during the day and there was no one left. I went to the dojo whenever I got off my shift at the railroad, but no one would be there. The founder would be in the fields already. When I greeted him he would say, “Ah, you’ve come,” and then we would train together, just the two of us. He was very good to me in that way. One day Ueshiba Sensei said, “Saito, get yourself a wife.” Fortunately, I ended up marrying Sata. I say fortunately because I wasn’t exactly a good catch as a husband, and I can’t think why anyone would want to marry her, either. Once we had settled on one another, Sensei said, “You can have the wedding in my house,” which we did. Soon afterward, however, he said, “You’re in charge of the place now,” and promptly left on a trip to the Kansai region. Well, I didn’t know what to do, so the next day I chased after him, following him all around Kansai asking him to come back. Because of that we never did get to go on a honeymoon. The founder’s wife passed away not long after he did in June of 1969 and I became the guardian and caretaker of the Aiki Shrine and the Ibaragi Dojo. At the time I was also teaching on Sunday at the Hombu Dojo. One day an American practicing there told me he wanted more than anything to stay in Iwama. There was nobody practicing at the Ibaragi Dojo at the time, and I was worried about leaving the place alone at night, so I figured it was a perfect opportunity. That person became the first foreign uchideshi there, turned out to be an excellent student and eventually opened his own dojo in San Francisco. He sent people to Iwama every year, and after a while they started coming from Europe as well. I remember when I originally began practicing aikido my only goal was to become strong in a fight. Eventually I realized how absurd that was, and I asked myself how it would be possible to achieve the much broader goal of creating a “world family.” I decided it must be through expanding the circle of harmony and unity (wa). People began asking me to go abroad, and I’ve now been overseas at least 50 times, and people from over 30 countries have come to train in Iwama. Wherever I go it feels like family at Iwama and all over the world, people are much the same. Thanks to the founder and thanks to aikido the world is becoming one family and life is becoming more and more enjoyable. As long as I am able, I am committed to correctly following the founder’s teachings, striving for world peace, international friendship, and working toward regional social development. Yes, there were difficult times, if you think about them that way, but I did only what I considered my duty as the wife of Morihiro Saito. I served my husband as I felt I should, and I served his teacher and his teacher’s wife. No matter what, I would never put myself before O-Sensei or my husband. O-Sensei once told me, “Saito is my student (deshi), but you are not,” but I resolved just the same that I would do my best for both of them. In those days women often went to meet their prospective husbands without ever having been introduced to them before. You just went to meet whomever you were told to. If you found the person acceptable you drank the tea you’d been served; if they didn’t suit you you could say so by leaving the cup untouched on the table. Back then, marrying someone outside the prefecture was still rather difficult. You also had to obey your parents’ wishes and it was difficult to marry someone without their approval. O-Sensei’s household was of a somewhat higher class than I was used to, and I had trouble understanding what he said because he spoke in the Kansai dialect, which I had never heard before. So I had a pretty hard time of it in many different ways. It was customary for brides to do their hair up in a Shimada-style coiffure, so women stopped cutting their hair when it came about time to be getting married. I didn’t have time to grow mine because everything happened so quickly, so I had to use hairpieces to make up the difference. In the old days the groom would come to the bride’s house and take her back to his home, where the wedding would take place. Our wedding was held before the Shinto altar (shinzen) in O-Sensei’s old house, so from that day I entered directly into the Ueshiba family. People like Koichi Tohei, Kisshomaru Ueshiba, and other prominent members of the Aikikai attended the ceremony. We were married so soon after the war that food rationing was still in effect. O-Sensei had his own land, so the household didn’t receive any rice rations; we had to grow enough to feed ourselves. If we didn’t work the fields we’d have nothing to eat. O-Sensei was still young then and did a lot of the work himself, but he also had his students help out. Of course, most of the people around here come from farm families, so they also had their own fields and food to worry about. Most couldn’t afford be at O-Sensei’s side all the time. When it came harvest time, though, O-Sensei couldn’t wait for the rest to finish harvesting their own farms, so he was pretty persistent in asking them to come help. For that reason, it was very difficult for some people to continue practicing aikido, and many gave up and stopped coming. My husband, on the other hand, was the last child in his family and had a job with the railroad. He didn’t have any family farm responsibilities to worry about, either, so I think O-Sensei found him just right and relied on him. About four months before the marriage O-Sensei said, “Saito, I want you and your wife to live here,” and he started clearing the trees on the land by himself in preparation for our arrival! Despite the fact we still didn’t have the permission of either of our parents, he was out there clearing land for us! The land was covered mostly with kunugi (a kind of oak) and there was no one around with time to clear it, what with other fields to attend to and so on. (We didn’t have a chance to finish the clearing until after we’d gotten settled, and even then it wasn’t completed while O-Sensei was still alive.) This house was finished on September 28, if I remember correctly. After all that our parents didn’t really have much choice but to resign themselves to the marriage. And of course my husband couldn’t really oppose his teacher, especially since he had gone through all the trouble he did. In those days a deshi didn’t disobey his teacher in any way. So that’s how we came to live here. The house didn’t have a proper tiled roof at first; it was just thatched with a base covering of cedar bark. Later, O-Sensei gave us the land, partly in gratitude for that fact that my husband had helped him straighten out certain difficulties regarding the surrounding property. Even when my husband came home from the night shift, I never saw him taking a nap the next day. Instead, he was always helping O-Sensei or training. Once the Aikikai was incorporated we stopped receiving fertilizer supplies from the town, so my husband went to the prefectural office and obtained a fertilizer subsidy. Then he found a fertilizer company about 20 kilometers away that had some left and spent all day hauling it back here in a cart on foot. After all, in those days if you didn’t maintain the farm you couldn’t eat. Helping O-Sensei with the work and the farming became part of my husband’s training. Because my husband was learning something he really liked from O-Sensei, I felt I should give him all the support and cooperation I could; otherwise I felt I didn’t really have a place there. That’s why I devoted myself to serving O-Sensei and his wife to the best of my ability. On the other hand, I also had four children of my own to raise, and there was nobody around to look after them for me. Sometimes I took them with me when I was helping O-Sensei and his wife. I was always running everywhere trying to attend to everything and get things done. I was so busy! O-Sensei could be very whimsical, so things to do were always popping up unexpectedly. Nowadays for the Taisai we just order boxed lunches from a place in Tokyo, but that’s a relatively new thing. We used to make them all by hand. We had to make 300 lunch boxes of sekihan (rice boiled with red beans) by 10:00 a.m., so I had the helpers come at 4:00 a.m., and I was up the whole night making preparations. I spent most of my time working the fields, pulling weeds around the house, and serving O-Sensei and his wife. Since getting married hardly a day has gone by when there haven’t been people going in and out. The only time I’ve ever had to myself has been after 11:00 at night. I don’t think I’ve ever sat down to all three meals in a day with my family. I can’t imagine how difficult this has been on my children. To help make ends meet, after my eldest son was born I took a side-job shelling chestnuts, which I did when I got home at night. Sometimes I could shell as many as 20 kilograms of them by myself. My husband only came home from work every other day. Unlike him, I couldn’t unwind by having a drink. Occasionally, I just couldn’t help myself and would complain to him and make him upset. In my position I had very few options for relaxing or taking a rest from it all. My kids used to make their own baths and help out in the kitchen. The second oldest would prepare the boxed lunches for school trips and so on, and the older ones would help me look after the younger ones. Their mother was always off at O-Sensei’s place and their father only came home every other day, so they knew they couldn’t depend on either of us. In fact, I actually depended on them quite a bit, and it was because of their help that I was able to devote my time to serving O-Sensei and his wife. I felt bad that I was not able to fulfill my obligation to my husband’s parents as well as I would have liked. So soon after the end of the war the food situation was still pretty bad, and they took care of my elder sister and I better than if we had been their own children. I would have liked to do something for them, but since my husband was the youngest of the four boys I wasn’t really in a position to do anything. So, I decided to put that energy into serving O-Sensei and his wife instead. I didn’t have any extra time so I never enrolled in the dojo, but three of my brothers did. Also, as soon as my children were seven I had them enroll. Many of the students who came to practice at the dojo would stop by our house first to say hello, but that would put O-Sensei in a bad mood, so I always told them to keep it just between us that they had come by. Of course, O-Sensei didn’t mind if they went to the dojo first and then told him they were going to drop by our place. O-Sensei got up at 4:00 every morning to pray to the kami. In the old days there were only two or three houses between here and the train station, and they said you could hear his voice all the way over there. O-Sensei’s younger sister, Kiku, often stopped by. She was very kind to me. She placed her hands together in front of her face [gassho, a gesture of respect, gratitude, and thanks] and said, “We are very grateful for all you do for our family.” I’ll never forget her. I once had my palm read by Shohei Kadowaki a famous fortuneteller who was a student of O-Sensei. Potential Prime Ministers and people like that would consult him. He came to our house shortly after O-Sensei passed away and said to me very seriously, “I’ve probably read 20,000 palms, but I’ve never seen one that tells of such devotion and self-sacrifice as yours. Incredible!” I had never even spoken to him, and yet he saw that in my palm. The year after the new Hombu dojo was built O-Sensei’s wife collapsed and was bedridden for a long time afterwards. She stayed in Iwama for a while, but then it was decided that she should be moved to Tokyo, although she didn’t want to go. “I’m staying right here!” she said. My husband and I went to visit her in her sickbed, and when it came time for us to go we would stand up and say, “Well, Okusama, we have to be going now. We’ll be back, so take care.” But she would grasp my hand so tightly that it almost hurt and hold onto it. I guess she was very strong from weeding and other work around the house. It’s a shame that so few people know of O-Sensei’s life here in Iwama and that he said he thought it the center of the world. Sometimes O-Sensei used harsh words, but in his heart he was a kind man. In his better moments he was like a Buddha and a kamisama rolled into one. Even if he had on one of his severe faces, he only had to smile once for you to know that he was truly very gentle. I can still see him now, whenever I close my eyes. Few today can claim to have practiced aikido for 50 years. Fewer still can boast of having spent some 20 years as a direct disciple of founder Morihei Ueshiba. And no one has exhibited a more complete mastery of the vast aikido technical repertoire than 9th dan Morihiro Saito. The story of how Morihiro Saito reached his position of prominence in a crowded field of many outstanding teachers is a fascinating chronicle. Saito is the classic case of someone who appears on the scene at just the right historical moment and possesses the rare attributes to excel far beyond what his peers have achieved. Morihiro Saito was a skinny, unimpressive lad of 18 when he first met Morihei Ueshiba in the sleepy village of Iwama in July 1946. World War II had recently ended and the practice of martial arts was prohibited by the GHQ. The founder had been “officially” retired in Iwama since 1942 although in reality he was engaged in intensive training and meditation in these secluded surroundings. Indeed, it was during the Iwama years that Morihei Ueshiba was immersed in the process of perfecting modern aikido. Among the handful of close students of those poverty-stricken days were Kisshomaru Ueshiba, Koichi Tohei, Tadashi Abe and a few locals from Iwama. The young Saito was given little encouragement initially and had to silently endure the intensive, often painful training. Saito recalls the early days when suwariwaza practice on the dojo’s hardwood floor would continue endlessly, leaving his knees bloodied and festering. To make matters worse, as a newcomer to the dojo he was on the receiving end of countless, vigorous techniques from strong seniors like Tohei and Abe. Gradually, however, Saito’s tenacity paid off and in a few short years he became one of the mainstays of Ueshiba’s country dojo. Moreover, he had the advantage of being employed by Japan National Railways on a 24-hr on, 24-hr off basis which left him with ample free time to spend at his teacher’s side. In addition to the hours he spent in the dojo, Saito would assist the founder in all aspects of his daily life, including the performing of numerous chores and farm work. Although the work was demanding and Ueshiba a strict mentor, his reward was the unique opportunity of serving as the founder’s training partner, particularly in the practice of the aiki ken and jo, over a period of some 15 years. Morihei Ueshiba would usually practice weapons during the early morning hours when regular students were unable to be present. So close had the relationship between the founder and Saito become after a few years that Ueshiba ordered his young student to get married and set up house on his property. Saito’s marriage took place in January 1952 and he and his new bride, Sata, would thereafter be close at hand to serve the founder and his elderly wife, Hatsu throughout the remainder of their lives. 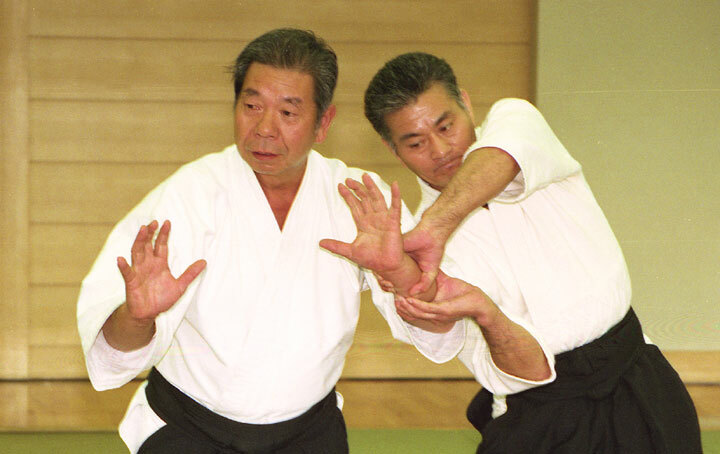 By the late 1950s Saito had become a powerhouse and one of the top shihan in the Aikikai system and taught regularly at the Iwama Dojo in Ueshiba’s absence. Moreover, he began instructing on a weekly basis at the Aikikai Hombu Dojo in Tokyo starting in 1961 and was the only teacher besides the founder himself allowed to teach weapons techniques there. Saito’s classes proved extremely popular and many Tokyo students would gather on Sunday mornings to practice taijutsu and the aiki ken and jo. When Ueshiba passed away in April 1969, Saito became head of the Iwama Dojo and also the guardian of the Aiki Shrine Ueshiba had built nearby. Every year since then, on April 29, a ceremony is held at the shrine to commemorate the founder’s passing. The publication in 1973 of the first of what was to become a five-volume collection of Japanese-English technical books established Saito’s reputation as one of aikido’s foremost technicians. These books contain hundreds of aikido techniques including taijutsu, aiki ken and jo and kaeshiwaza. These manuals introduced a classification system and nomenclature for aikido techniques, which have since achieved wide acceptance. Unfortunately, the publication of this series was prematurely halted at five volumes. In 1994, Saito began publication of a new series of technical books titled Takemusu Aikido in cooperation with Aiki News. So far three volumes have appeared in the series which will cover the entire range of aikido techniques practiced in Iwama. In 1974 Saito made his first instructional trip abroad to the U.S. This writer was present at his Northern California seminars and remembers vividly the amazement of the participants at Saito’s encyclopedic knowledge of aikido techniques. This, coupled with his clear teaching method replete with numerous gestures, made the services of an interpreter almost unnecessary. Saito has since traveled abroad more than 60 times and has far more invitations than his time and energies permit him to accept. The popularity of Saito’s books and his extensive foreign travels have resulted in the Iwama Dojo becoming a Mecca for foreign aikidoka wishing to train intensively and gain experience in the use of the aiki ken and jo. Over the years, literally hundreds of students have journeyed from abroad and sometimes the foreign practitioners have outnumbered their Japanese counterparts in the Iwama Dojo. Perhaps the secret of Morihiro Saito Sensei’s success among enthusiasts resides in his unique approach to the art, which is a mixture of tradition and innovation. On the one hand, he is totally committed to preserving intact the legacy of techniques bequeathed by the founder. That is to say, Saito views himself as a bridge to connect present-day practitioners with the original aikido of Morihei Ueshiba developed in Iwama. At the same time, Saito has displayed great creativity in organizing aikido’s curriculum, thereby revealing the art’s deepest principles and the intricate relationships among its numerous techniques. Today Morihiro Saito continues a heavy schedule instructing morning classes devoted to the aiki ken and jo and general practice in the evenings where he teaches taijutsu techniques. Also, several university seminars are held each year at the Iwama Dojo, a practice that has gone on since the days when the founder was still active. Saito is continuously honing his technique and devising new training routines to make his teaching methods more effective. Saito’s son, Hitohiro (6th dan) is himself a master technician and gifted teacher. The younger Saito has gradually assumed more responsibility, as interest in Iwama aikido has grown worldwide. In the aikido world today, there is an ever-increasing tendency to regard the art as primarily a “health system” and the effectiveness of aikido techniques is little emphasized. In this context, the power and precision of Morihiro Saito’s technique stands out in great relief and, due to his and the efforts of a few others, aikido can still proudly claim the right to be regarded as a true budo. Aikido Journal joins in congratulating Morihiro Saito Shihan on his 50 years in aikido and expresses its sincerest wish that he be blessed with the best of health to continue along the Aiki path for many more years! Check out the most extensive resource on Aikido ever created that answers all your technical questions!